Buried electrical wires can easily be damaged when doing landscaping or construction, causing a loss of power to anything from dog electric fences to detached garages. Reconnecting severed wires or adding branch circuits to existing wiring by splicing can quickly restore or add function at an inexpensive cost. Disconnect all power to the electrical wires being repaired, by turning the appropriate circuit breakers into the off position within the main electrical panel. Test outlets and wiring with the Volt meter, to determine if electrical current is still present. Contact the utility company or city electrical workers in situations where power is still supplied to the wiring and cannot be disconnected. Dig a hole to the appropriate size and depth to accommodate the splice kit materials, located where splicing will be installed. Prepare the wiring by removing the frayed or damaged end with the wire cutters or lineman pliers. Strip insulation using the lineman pliers or wire strippers, to expose a length of bare wire no longer than is required to fit in the crimp or wire nut included with the kit. Exposed wiring can easily be damaged by corrosion, which reduces efficiency and conductivity and can lead to safety hazards. Refer to the National Electrical code in situations where wiring is too short to be reconnected by a splice, or where conduits are used, for alternative solutions. Refer to the kit instructions for any special instructions or techniques that are required to perform proper installation. Twist the exposed ends of wiring together with the lineman pliers in a clockwise motion to prevent wiring from coming lose or breaking contact when splicing with wire nuts. Fasten the wiring together with the lineman pliers by inserting wire ends into the crimp and applying pressure to the center. Gently tug the wires in opposing directions to ensure they are properly connected. Install any sheathing or protective materials over the splices, according to the kit instructions or National Electrical Code standards. Check the repairs by reconnecting the power, and test electrical current with the Volt meter. Disconnect power and repair any improperly functioning splices, or contact an electrician for further assistance. Install splice seals, by using tools such as the heat gun, screwdriver, wrench or scissors, with the materials provided, while following the kit instructions. Use the shovel to bury and cover wiring and splices at the appropriate depth. Buried or underground wire splice kits commonly contain wire nuts or crimp connections. Additional features may include sheathing or gels based on intended use. Always wear safety glasses, dry leather gloves or any other personal protective equipment required when doing home renovation or electrical repairs. Never work on, or attempt to repair city buried electrical lines under any circumstance. Report damages or problems immediately to your utility company or city building hotline. 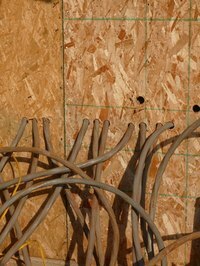 Refer to the National Electrical Code for minimum work quality standards when working on buried electrical wiring.